When Kendall meets Denn, she begins to believe there are truly good men in the world. Denn is everything she wants: strong, loving, dedicated to family, protective. . .and patient. There is instant attraction between them, but Kendall is leery of men, and Denn craves a serious relationship that includes marriage and children. Their courtship is a conflicting mix of hesitancy and passion, with Luna, desperately needing a mother figure in her life, cheering them on. As Kendall learns how to trust again and her romance with Denn grows more intense, a local woman who’s had her eye on Denn for years releases a torrent of damaging jealousy. . .and the nightmare from Kendall’s past discovers where she’s hidden herself. Okay, that’s a bit of a different take on the standard “hiding out” scenario, but it all depends on what you’re running from and where your hiding place might be. In my new release, Unsafe Haven, the hiding place would be Southwest Alaska, one of the most remote regions in our forty-ninth state. And my heroine, Kendall Martin, thinks it’s far away enough to—finally—escape the sociopath she was engaged to. But here’s the thing about sociopaths: they’re ridiculously compulsive, and in a lethal game of “Hide and Seek,” they have this overwhelming need to win. But Alaska is such a big state, with so many hiding places. Right? Yes, it’s big. And it’s tough to get in depending on where you’re headed. In Southwest Alaska where roads stop abruptly in the middle of nowhere and mountain ranges and bodies of water thwart civilization at every turn, it’s possible to find small pockets of people who have survived despite the harsh beauty of the land and have eked out a living. Tiny villages dot the Kuskokwim River and scatter over the tundra, bracketed by the same mountain ranges that defeat their narrow gravel roads. Bush planes fly in often enough to drop food, medical supplies, even something as whimsical as a prom dress or a wedding cake. One of those bush planes drops Kendall into Staamat, predominantly Native Alaskan and in proud possession of a two-man police force. She’s safe, at last. She can stop worrying. Maybe. Maybe not. You see, now she’s kind of trapped, though she doesn’t yet know it. 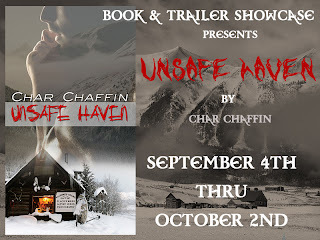 Alaska as a setting played a huge role in writing Unsafe Haven. I used to live in Alaska—Fairbanks, in fact—and I always wanted to set a story there. Talk about a land rich with inspiration, Alaska is it. Over the years I’ve answered my share of questions posed by folks who have never been up there and have no idea what it’s like. Thanks to popular cable reality shows such as Flying Wild Alaska, Alaska State Troopers and Ice Road Truckers, more people are getting a better understanding of the more remote Alaskan regions. But there are things about Alaska I just couldn’t explain, like the soundless hiss the Aurora Borealis makes on a forty-below winter night when the colors dance across the black sky. The way a hungry raven will strut right up to you and demand a share of your meal, should you happen to be noshing on your lunch outside during a warm summer day. Town moose in the yard and snowy owls on the wing, gliding overhead. Midnight sun and endless snow. These images and so many more were in my heart as I wrote. Kendall, on the run and searching for safety, finds what she needs when she meets up with Denn Nulo, my handsome, strong and caring Native Alaskan cop. But sometimes the most danger you face is cloaked in the last person you’d imagine could ever harm you, as my two would-be soul mates are about to find out. Setting my story in Alaska was a no-brainer for me and provided me a wonderful walk down memory lane as I wrote Kendall and Denn into the mysteries and wonder of the Last Frontier. If only all my settings could come together this easily! What are some of your favorite settings for a novel? Do you prefer to keep it real or to add in your own imagination to a chosen locale, creating entire cities and even countries? 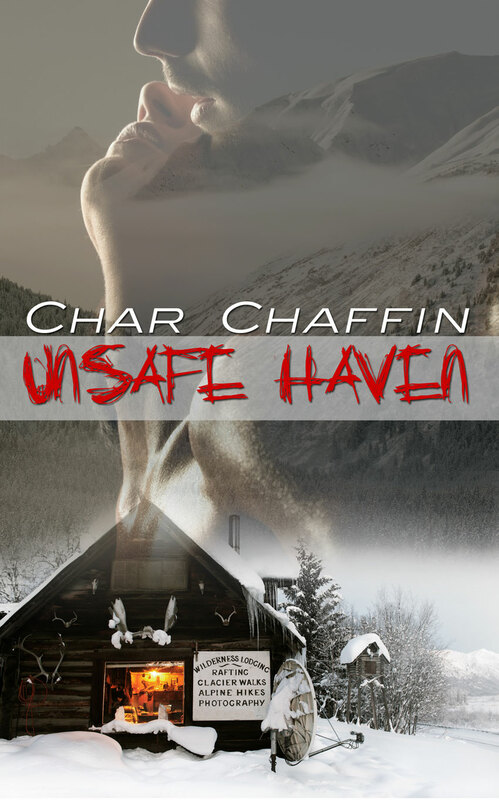 To enter to win a copy of Unsafe Haven, just answer Char’s questions in the comments below. This giveaway is closed. The winner is Rose. Hey Char! The books sounds so wonderful!! I love suspense, especially in the middle of nowhere. I like taking my real life settings and tweaking them a bit – changing the town’s name, adding a couple of landmarks and so forth. Excellent way to shake up the dynamics, Donna. Take a familiar place and make it your own! Thanks for the comments and stopping by! Hi Char. I absolutely loved UNSAFE HAVEN. Once I started reading it, I couldn’t put it down. I’m anxiously awaiting your next book. Thanks, Janna! I owe you the biggest hug when I finally get to meet you! Hi Char! I can’t wait to read UNSAFE HAVEN! To answer your questions: I think it depends on the book. If I’m writing fantasy, world-buidling is a part of the game, and I love to imagine what a new and different place will look like. If I’m writing something historical, I like to delve into the details of the time period to try to get them right when I create a scene. And if I’m writing contemporary, I often use places I know well, like my hometown, as settings so that I can really get into the feel of the plot and the characters’ motivations. Whichever way it happens, it’s definitely fun to be a writer! Hi Rose! I completely agree, it’s fun to be a writer. I haven’t tried my hand at world-building but I’d love to take a shot at it one of these days. But you’re right, no matter how you do it, something magical happens as soon as you start manipulating words. Thanks so much for stopping by! I love Alaska, and I love reading books set there. This sounds like a great read. As for settings, I’m very partial to books set in the SF Bay Area since that’s where I live. Really though, just about any setting will work for me – because I love to travel, if I’ve been there, I will enjoy revisiting it through a book, and if I haven’t been there, I love finding out about new places. I do prefer real settings rather than imaginary ones though, because I like to picture myself in the setting and that’s hard to do if it’s a fantasy. Hi Jen! I, too, enjoy reading a book set in a favorite locale. I’ve traveled all over the US and Canada. There’s so much beauty in North America, how could we not be inspired? Thanks so much for your comments! I like it when a book is set in a locale favorite. That way I can go there and do the tourist thing with people looking at me like I’m nuts. Always a lot of fun. Thanks, Stacy! Your comment gave me a chuckle. I’ve played tourist in familiar places, too. It really is fun. Thanks for stopping by! I love suspenseful books and this one looks great, I am excited to read it. I love all types of setting, it just depends on what I am in the mood for. I have a large TBR pile and I will pick a book depending on where I want it to take me, sometimes I am looking for a different world so a UF will be great and sometimes I want a familiar setting so I will pick up a contemporary book to bring me back to this world. I like them all. Hi Pam! You and I might be twins in a former life. 🙂 I have the same TBR pile and it’s got just about every genre in it. I look for complete escapism when I read, and stockpile books accordingly. Thanks for chatting with me! The story sounds like my kind of reading… definitely added to my wishlist! You might be the triplet to me and Pam! 🙂 I’m definitely a mood-driven reader, too. Thanks so much for dropping in! Thanks for a great post and congrats on the newest release! I love reading about places I’ve not been to. But I leave it in the hands of the author to make it authentic or not. I just trust that they do the place justice 🙂 But on the flip side, I also like when an author “reimagines” or makes up a location too. if they can make me believe it, that’s all I want!